Short post about the new version of AirPrint Activator. Version 2.1b4 is now available for download. 2. Some other bug fix. To download go to the main AirPrint Activator page. HP photosmart 7700 seriesboth printers are networked through the USB connection on a Time Capsule. Each are shared through my iMac. The iOS devices are connected to the time capsule wifi and the iMac that Activator 2.1b4 is running on is wired to the time capsule.Anyone have a possible way for this to work. That typically happen if you are running with the OSX firewall ON… Is this the case? Printer is Brother MFC-7460DN on ethernet connected to Mac Pro with OS X 10.7.3. Printer is shared, firewall is off. Printers show up in Activator and show up on iPad/iPhone. I can pick shared printer on Mac Pro or I guess direct. I turn off 2-sided printing on iOS device. Press print. Nothing happens, nothing gets queued. Same with either printer choice. No errors in console on Mac Pro. Also, printer is NOT connected directly to Mac Pro via ethernet… it’s connected to same Airport Extreme as Mac Pro via ethernet and set up as a printer on Mac Pro. Print/scan work perfect from Mac Pro. I have 2 Macs running 10.7.3. I tried both Macs with AirPrintActivatory 2.1b4. I removed sharing and reenabled sharing on all my printers. I have 3, plus PDF. All showed up on the AirPrint Activator page as being advertized. My iPhone 4s is at iOS 5.1. When I try to print the iPhone searches and then reports it can’t find any printers. I’m running Little Snitch and it never prompts me to see if AirPrintActivator can use the network. Can I get an explaination of how AirPrintActivator uses the network without running into Little Snitch. Maybe that can point to the problem. I also have Wireshark and am willing to do traces to get AirPrintActivator to run. AirPrint is a Bonjour protocol. Make sure your iPhone is on the same network as your Mac doing the advertisement. Make sure your iPhone is not running an active VPN session as it will prevent it from seeing Bonjour advertisement. If your printer are networked then make sure you allow incoming connections to aparedir. I have a Xerox printer hooked by Ethernet through a hub to the Airport Extreme/Timecapsule router. Set up APA 2.1b4 (downloaded yesterday) on my 2.5 GHz iMac which (is also on the Ethernet) following the setup video. The printer shows up on both the APA app and my iPhone as “APA Xerox Phaser 6280DN”. However, when I push the print button, I get a screen which says “Printing to ‘APA Xerox Phaser 6280DN’ – Contacting Printer . . . ” until it times out. No printing. Any thoughts? Interestingly, if I turn off the firewall in 10.7.3 Security & Privacy preferences, the print screen shows “Preparing . . .” for perhaps 30 seconds before flashing a very quick line I can’t read and then the print screen closes as if it has completed the job. Still no printing, however. Apparently resolved. I went back to Airprint Activator app after turning off the firewall and notice that I now have two printers: “APA Xerox Phaser 6280DN” and “”APA Xerox Phaser 6280DN @ Ed’s iMac”. When I select the latter printer on my iPhone, the print job completes. I don’t seem to be able to select “Advanced Settings” in the APA. It is grayed out. I need to be able to tell it to share only local printers. Any assitance would be greatly appreciated. I can’t get my printer to show up on the advertised printers’ list in Airprint Activator. I’m running 10.6.8 and my printer, Canon MP490, is connected via usb to my desktop, the printer is definitely shared on my wi-fi (I’ve printed through that from my laptop without any problems), I do not have a firewall activated. I have tried deleting the printer and re-adding it. Have tried turning it off and on again, tried deleting the latest version and installing v2.1b4 instead, but had same issues, so I installed v.2.1b6 again. Just for the kick try changing the computer name. Some have reported issues with a compute name bug. 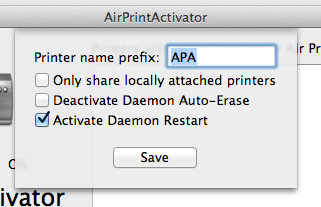 I need to delete this but i can’t because “airprintdaemon” is in use. What do I do? Simply stop AirPrint with the on/off switch and then delete the complete folder. That should do the trick. The Advance Settings button on my AirPrint Activator screen is grey and unavailable. how do I get it to become active?